1. Please submit a survey (See 2nd post for Survey information) if you want to participate in this swap. Surveys should be emailed to me, the swap hostess, auntbubbels at nyc dot rr dot com. I will send you a confirmation email when I receive your survey, and your name will be added to the list of swappers posted below. Surveys can be submitted until: April 29, 2014 at 5 p.m. (EST). 2. It is not required that you answer all the questions on the survey (except for name, address, and C'ville nickname), but it is a good way for your partner to know your other preferences. 3. Partner assignments will be e-mailed to you by: May 1, 2014. Packages must be POSTMARKED by: June 7, 2014. Delivery Confirmation is required whenever it is available (all domestic packages), and the delivery confirmation number MUST be emailed to the swap coordinator. Please email the swap hostess, auntbubbels at nyc dot rr dot com, when you receive your exchange partner's information so that I know you received it. All packages must be received by the end of the swap on: February 16, 2014. 5. E-mail the swap hostess, auntbubbels at nyc dot rr dot com, when you receive your exchange partner's information so that I know you received it, and when you send and receive your exchange item(s) so that I can record who has sent and received. 7. Make sure your postage and receiver's address are correct before mailing. 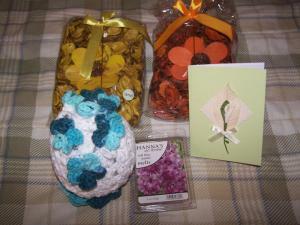 Mark your package with "Crochetville Kiss Sachet Swap". Do not forget delivery confirmation is required whenever it is available, and the delivery confirmation must be emailed to the swap coordinator. This is not only proof of mailing, but enables you to trace the package if it is lost in the mail. 9. If your package is not postmarked by the POSTMARK BY date of June 7, 2014, you will be subject to the consequences listed in the 2013 Swap Guidelines. Please contact the swap coordinator BEFORE the mailing deadline passes if there is a problem. Do you prefer a particular yarn color(s)? Would you like you sachet to be (solid, variegated, two toned)? Have you read the Copyright/Trademark Guidelines for Swaps and RAOKs? And do you agree to follow these rules? Guess I will be the first. Survey sent. Right now you are the first and only!!!! Got my partner and I have e-mailed her. This is going to be very interesting and fun. Howdy partner. I've been checking out all the wonderful sachet patterns but somehow I need to narrow it down.....boy is that tough. I will definitely have one in mind by the weekend so I can get started. Okay, so I did narrow down to one pattern and have started the sachet. It is coming along pretty. You'll love the scent that I will using. You should be okay with it and not be sneezing away. . I have finally narrowed mine down also. I just finished a birthday gift, so this is next on my list. The scent I am still working on. My sachet is done and ready for the mail. I will be packing it up tomorrow. This has been an interesting and fun swap. Oh boy!!! I can't wait to get it! I was able to work on yours tonight but have some finishing touches. I'm not sure yet what I want to add to it. Also, I haven't scented it yet and will do it just before I mail it because I want it to stay scented as long as possible. My partner is mailing my sachet out and I will be eagerly anticipating receiving it! The package is on the stoop waiting to be picked up. I would start looking for it Thurs or Fri. If all goes well with the PO that is. Boy it was fun looking and finding the right sachet. I do hope you like it. Ok I jsut checked and your package left Tampa at 1:37 this morning. They are saying delivery TOMORROW Yeah. Now I am getting nervous. There is a good possibility that my sachet will be here today. I am so excited and will definitely let you know!!!! My gorgeous sachet from Tampadoll did in fact arrive and it smells so beautiful!! Thank you so much. . I absolutely love it. 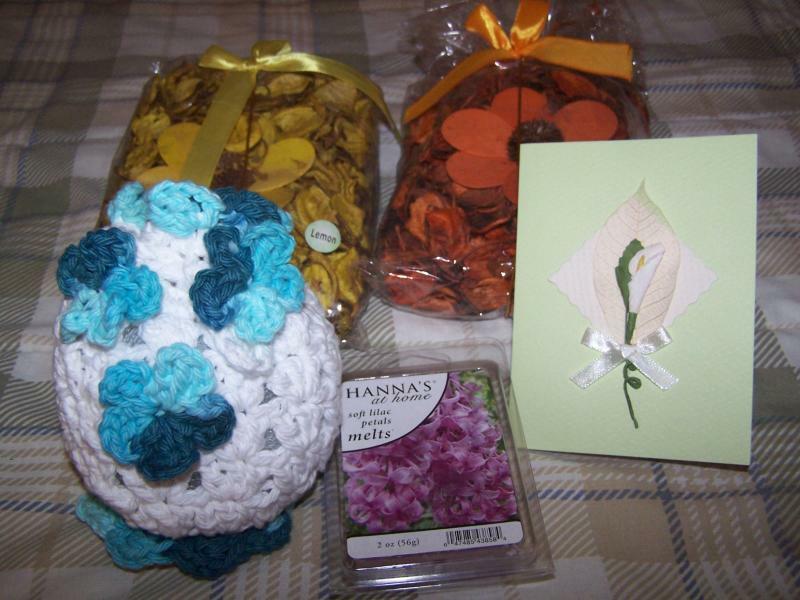 She filled it with a lilac wax cube and sent me extra cubes along with lemon and international potpourri. The scent of each is so amazing! She also created the most beautiful card with a lily on the front. Lily of the valleys are my most favorite flower. 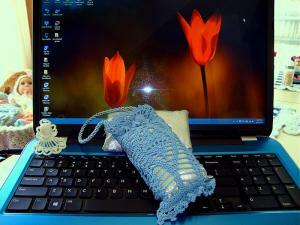 Once again, thank you Tampadoll, for such a wonderful sachet! So glad it arrived, and the scent is ok that I sent. I can hardly wait to see mine. I should be getting mine today. I can hardly wait to see it. Got my sachet today. Isn't it pretty and it smells so nice also. #1Crochetfan, put lemon zest oil in it. The color is perfect and it fits perfect in my bathroom. I can even hang it on the door. 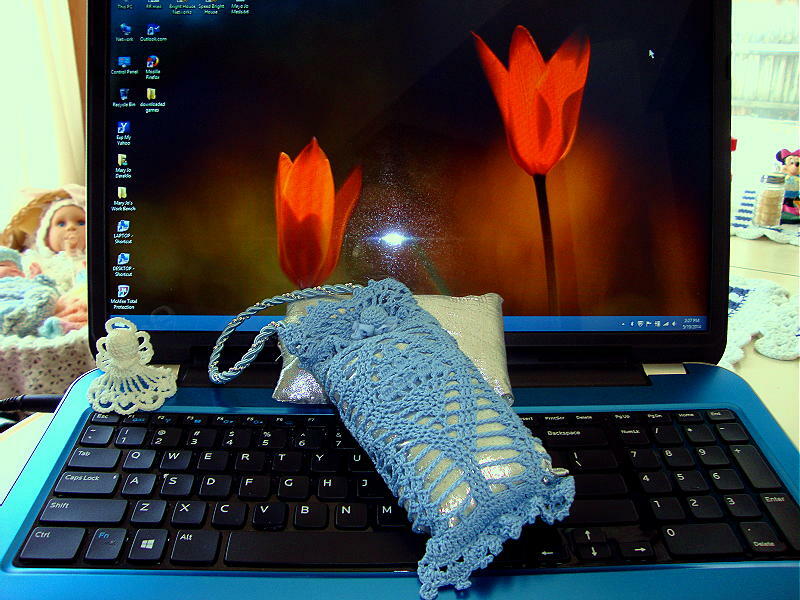 Thank you so much for this very pretty sachet and thank you for being my partner. Hey Auntbubbles thanks for not shutting this down, even though there were only 2 of us. What fun it was. You both did beautiful work on your sachets. Enjoy your new scents. This swap is officially over. I also enjoyed having you,Tampadoll, as a partner. We both had a fun time. Sachets are fun to swap because they are easy to make and smell pretty.